The Matches Fashion sale is a doozy this year. There are so many fun things for summer: The star-studded YSL bag, the too-cool Joshua Sanders pool slides, the striped Lanvin boater hat. Yes, yes and yes. 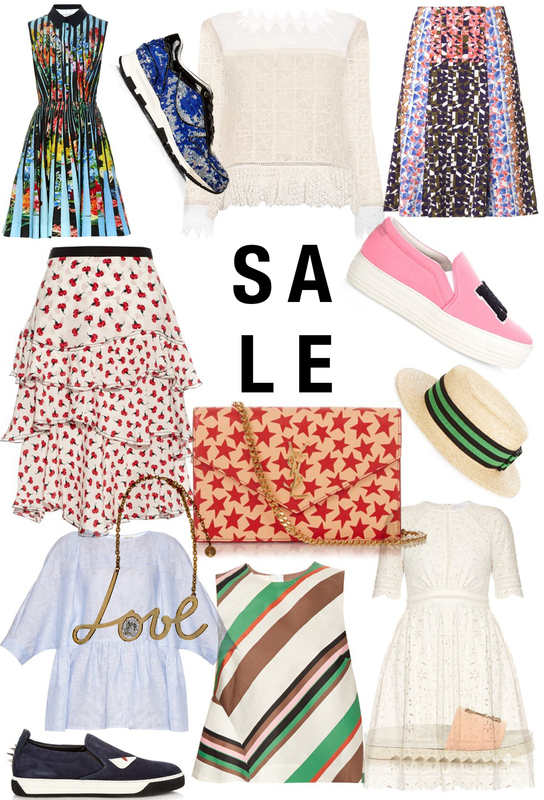 This sale is trouble with a capital T.
If you’ve never before shopped Matches Fashion, a note: The web site is one of my favorites, or shall I say favourite since they are based in the UK. Items arrive lickety-split, from England, no less, and the customer service is fantastic. Returns are super fast and easy. Items are beautifully packaged and they obviously have a great edit. I have been wanting the Joshua Sanders slip-on platforms for eons (and now there are slides!). The platform version is actually very hard to come by on sale. What do you think: NY or LA? Decisions, decisions. I also really love the YSL bag. It’s such a fun piece for summer and the price isn’t too steep. The Mary Katrantzou dress is another find. It’s obviously still an investment but considering how much her prints go for, even on sale, this one isn’t so bad. And it’s a dress I really love. Here are a bunch more things that caught my eye from the Matches Fashion sale. Tell me what you’re snapping up and happy shopping!